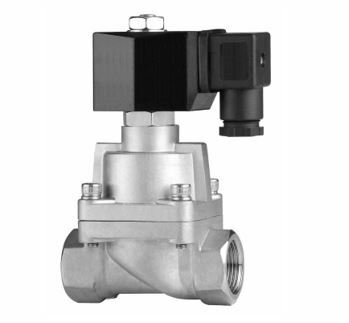 PLG22 High Pressure Series, N/Closed, Stainless Steel Solenoid Valves. The Valve Body is made of 304 Stainless Steel. Seals are PTFE. The Maximum Body Pressure is 100 Bar. The Operating Differential Pressure range is 1 to 45 to 75 Bar (See data sheet for detailed spec). Temperature up to 110 Deg Celsius. The Specialized Piston Design has PTFE Embedded Ring seals. The guide rings on the piston Isolates the media from the coil.